It's official. I am on a yeast kick. I'd almost go as far as saying that I'm a little obsessed. I don't know how I can explain it; bake a loaf of bread or a yeasted coffee cake, and you'll understand. 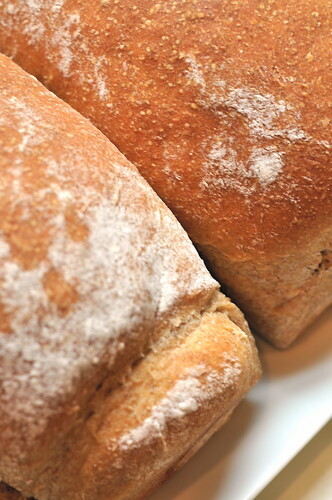 There is something truly magical about bread. Although it is said that man cannot live by bread alone, I am certain that I could live on bread....well bread and cookies that is. Whole wheat bread is one of my vices. We generally have a loaf in the house somewhere. I have a hard time resisting pulling of a tiny corner to nibble or slathering a thin slice with a layer of salty Irish butter. It is a little heartier and more substantial than white bread. A little more satisfying in a way. This recipe delighted me. It surprised me, actually. I was not entirely present mentally when I set out to make it- I wasn't invested in the process. Thank god it is a forgiving recipe. Not only did I leave it on the counter to rise for an extra 5 hours but also forgot about it in the fridge for 3 days. Three whole days! In my defense, the first oversight happened because I went to my best friend's house to say goodbye, as she was leaving the next day for college. The second one I can only blame myself. I got caught up in a lot of nothing. I almost threw this little guy out, but I am so very glad I did not. It has a nice bit of sweetness from the maple syrup, but it would not be too sweet to accompany a plate of eggs or a cool bowl of gazpacho. However, if you, like me, are drawn to the dark side, the sweet side, it is awfully scrumptious buttered and sprinkled with cinnamon sugar. 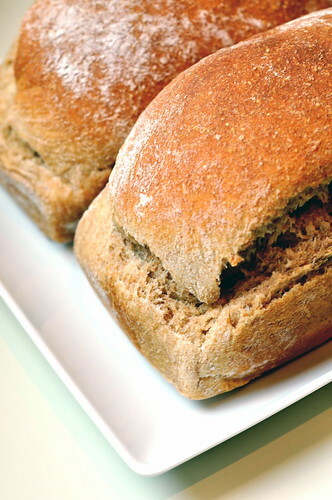 Whichever way you choose to enjoy this bread, it definitely delivers on the flavor front. 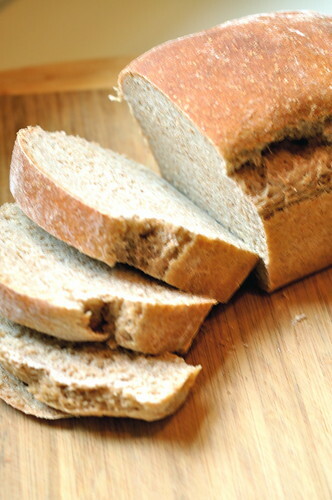 It is simply a bonus that it contains whole wheat flour. I know, I know. Some of you may be rolling your eyes. I honestly love the flavor of whole wheat because I think it has more depth. I'm sure you could make this recipe with only bread flour, but I just don't think it would do it for me. I am so happy I re-discovered my Williams-Sonoma Bread cookbook. 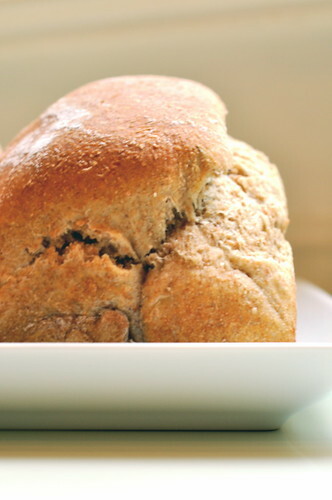 (Hopefully) next up on the bread front- oatmeal molasses bread. Dissolve the yeast and the brown sugar in the warm water, letting it stand until the yeast has foamed. Whisk the buttermilk, maple syrup, and canola oil together in a bowl. Beat the liquid mixture, salt, and 2 cups of the whole wheat flour together in the bowl of your stand mixer for 1 minute. Add the yeast mixture and the remaining cup of the whole wheat flour and beat until combined. 1/2 cup at a time, beat in the bread flour until the dough is cohesive and begins to form a ball. Replace the paddle attachment with the dough hook and knead the dough on low speed for 5 minutes, adding more flour as necessary. Place the dough in a well-oiled bowl and cover with plastic wrap. Let rise in a warm place until it has doubled, which should take about an hour and a half. Grease two 9-by-5-inch loaf pans. Set the dough on a lightly floured surface and divide in half. Fold each rectangle in thirds, as you would with a letter. Starting at the narrow side of the rectangle, roll the dough into a short-ish, thick log. Set each log in the loaf pans, seam side down. Preheat the oven to 350 degrees. Let rise another hour. Bake for about 35 minutes until the loaves are a deep honey color and start to pull away from the sides of the pan. Remove from pans and cool completely on a wire rack. there is nothing better than this great bread. I love it because you can grab a piece, put a little something on it, like almost butter and you have a super fast, healthy meal on the go. it is especially nice with a generous slather of nutella too!